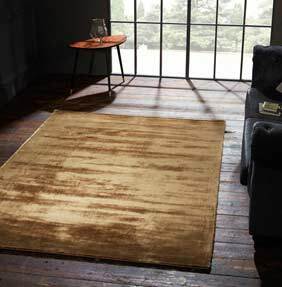 Cairo uses the silkiest, softest viscose which offers a stunning shimmering lustre and unique glow effect. Each rug is delicately and expertly handmade. The weavers use fine weaving skills to creating a tight, smooth weave that packs the fine viscose fibres together to give a luxurious, intense shine and shimmering look. Cairo is made in three rich and silky earthly shades, walk around this plain rug and see the reflected metallic sheen move and change from each viewing angle and under altering light variations. These premium high quality, heavyweight rugs are seen in designer apartments and hotels. The perfect rug for a trendy owner!